Three major outer membrane protein genes of Escherichia coli, ompF, ompC, and ompA respond to stress factors. Transcripts from these genes are regulated by the small non-coding RNAs micF, micC, and micA, respectively. Here we examine Photorhabdus luminescens, an organism that has a different habitat from E. coli for outer membrane protein genes and their regulatory RNA genes. By bioinformatics analysis of conserved genetic loci, mRNA 5'UTR sequences, RNA secondary structure motifs, upstream promoter regions and protein sequence homologies, an ompF -like porin gene in P. luminescens as well as a duplication of this gene have been predicted. Gene loci for micF RNA, as well as OmpC protein and its associated regulatory micC RNA, were not found. Significantly, a sequence bearing the appropriate signatures of the E. coli micA RNA was located. The ompA homolog was previously annotated in P. luminescens. Presence of an ompF-like porin in P. luminescens is in keeping with the necessity to allow for passage of small molecules into the cell. The apparent lack of ompC, micC and micF suggests that these genes are not essential to P. luminescens and ompC and micF in particular may have been lost when the organism entered its defined life cycle and partially protected habitat. Control of porin gene expression by RNA may be more prevalent in free- living cells where survival is dependent on the ability to make rapid adjustments in response to environmental stress. Regulation of ompA by micA may have been retained due to a necessity for ompA control during one or both stages of the P. luminescens life cycle. This article was reviewed by Tal Dagan (nominated by Dan Graur), Mikhail Gelfand and Anna Gerasimova (nominated by Mikhail Gelfand) and J Peter Gogarten. Reviewed by Tal Dagan (nominated by Dan Graur), Mikhail Gelfand and Anna Gerasimova (nominated by Mikhail Gelfand) and J Peter Gogarten. For the full reviews, please go to the Reviewers' comments section. Outer membrane porin proteins allow for the passive diffusion of small solutes into the bacterial cell. Passage of molecules through the cell envelope and control of this process are crucial to cell survival when nutrients are scarce or when the cell is exposure to toxins or other adverse conditions. In E. coli and related gamma-proteobacteria, the major outer membrane porin proteins are OmpF and OmpC . ompF and ompC genes are regulated transcriptionally by transcription factor OmpR in response to osmolarity change in the environment . ompF is also regulated post-transcriptionally at the level of messenger RNA stability by the trans-encoded antisense RNA micF in response to various environmental factors such as temperature increase, oxidative stress and exposure to toxic compounds . Regulatory non-coding RNAs (ncRNAs) in prokaryotes are also referred to as trans-encoded antisense RNAs. ompC in E. coli is regulated post-transcriptionally by the regulatory ncRNA micC . OmpA, another major outer membrane protein, has multiple and more complex functions  For example, OmpA adds to the stability of the cell envelope by linking the outer membrane to the peptidoglycan. It is involved in bacterial conjugation  and functions as a porin protein as well . The stability of ompA mRNA varies with bacterial growth rate  and ompA mRNA is degraded at a fast rate when cells enter stationary phase . Udekwu et al  recently showed that the regulatory micA RNA post-transcriptionally regulates ompA mRNA. In addition, micA is induced at stationary phase, a stress condition . Thus in E. coli, three major outer membrane proteins, OmpF, OmpC, and OmpA are all regulated by specific small RNAs in response to stress factors. Photorhabdus luminescens is phylogenetically a member of the gamma- proteobacteria based on analyses of 50 gamma proteobacterial 16S rRNA genes . In a phylogenetic tree based on the sctV gene (which encodes a highly conserved inner membrane protein), P. luminescens falls into the Yersinia family . P. luminescens has a complex life cycle and proliferates in two distinctly different environments [13, 14]. P. luminescens lives symbiotically in the nematode gut, but also has a pathogenic phase when the worm, which normally resides in the soil, infects an insect. In this stage, P. luminescens cells are released into the circulatory system (hemocoel) of the insect by the nematode. Here the bacteria grow and commence with the rapid killing of the insect and both the nematode and the bacteria feed from the dead insect [13, 14]. After nutrients derived from the insect carcass are depleted, the bacteria re-associate with the nematode and the symbiotic relationship is re-established. P. luminescens has not been found as a free living organism and thus differs significantly from E. coli and most other closely related gamma-proteobacteria. During the evolutionary period when P. luminescens evolved into a symbiont and a pathogen, its genome expanded such that it has one of the largest chromosomes of the gamma-proteobacteria (~5.7 Mb) . This expansion is related to its pathogenic phase [13–15]. However certain genetic elements that contribute towards survival in a harsh environment but are no longer needed may have been lost from the genome during evolution of the organism. Using a bioinformatics approach, the P. luminescens genome was analyzed for outer membrane porin protein and associated regulatory RNA genes. We find a limited presence of the porin genes and their RNA regulators. Analysis of nearest neighbor genes in the gamma subdivision of proteobacteria reveals a conserved gene arrangement surrounding the porin protein gene ompF in species closely related to E. coli (Figure 1). OmpF is flanked on one side by aspC, the aspartate aminotransferase gene and by asnS, the asparaginyl-tRNA synthetase gene on the other side. In addition, pncB (nicotinate phosphoribosyltransferase) and pepN (aminopeptidase N) are situated to the right of the ompF gene locus in the schematic shown. Similar gene arrangements for the ompF locus are also in more distantly related organisms, e.g., Buchnera aphidicola str. Sg. The loci in Yersinia species (not shown) have the same gene arrangements, but ompF is referred to as a general porin gene, e.g., see yptb1435, Yersinia pseudotuberculosis IP 32953, complete genome annotation, . However an ompF ortholog has been located in this locus in Yersinia species . Xenorhabdus nematophilia, which has an ompF -like porin gene (opmP), displays the similar nearest neighbor gene arrangement as that in E. coli . X. nematophilia has a similar life cycle as that of P. luminescens. ompF gene locus in Escherichia coli CFT073, Shigella flexneri 2a str. 2457T, Salmonella typhimurium LT2, and in the Photorhabdus luminescens subsp. laumondii TTO1 locus with annotation as ompN. In the S. typhimurium locus, genes pncB and pepN (not shown) are present however there are three genes inserted between pncB and asnS. The unmarked blue gene in E. coli is a hypothetical protein 61 amino acids long. The unmarked pink gene in S. typhimurium is a partially characterized protein and assumed to be a putative leucine response regulator. Gene arrangements are as shown on the NCBI website . In P. luminescens, an identical nearest neighbor arrangement is present around the gene annotated as ompN (Figure 1). ompN is flanked by aspC and asnS with pncB and pepN situated adjacent to asnS as is found in E. coli and the other species shown. However, Photorhabdus also has a hypothetical protein gene (plu1752) situated between ompN and asnS (Figure 1). Thus the gene annotated as ompN in P. luminescens has the enterobacterial ompF chromosomal locus signature with the exception of an inserted protein gene. Analysis of nearest neighbor genes and their conservation in related enterobacterial species has been reported before, e.g., for non- coding RNA genes . In addition Notebaart et al  have presented a detail analysis of nearest neighbor genes, protein amino acid sequence and gene function predictions. A comparison of amino acid sequence identities of the P. luminescens OmpN with representative gamma-proteobacteria outer membrane proteins is shown in Table 1. The highest identity is with OpmP, the OmpF-like porin in X. nematophilia. However identities with other porin proteins in other bacteria are also high and a clear segregation of OmpF protein sequences is not apparent (Table 1). Due to evolutionary relatedness between many outer membrane proteins, there is high sequence identity between these proteins, but they are not necessarily orthologs of each other and identities between porin protein amino acid sequences is of limited use in gene annotation . ompN is not uniformly found in the gamma-proteobacteria. For example, there is no annotation for the ompN gene in Yersinia pestis and a protein blast search using the E. coli OmpN protein sequence does not yield an orthologous protein in the Y. pestis genomic sequence. Additional characteristics of ompN in other species are discussed below. mRNA 5' UTR sequences can be important markers in identifying protein coding genes . In the study here, a comparative sequence analysis of 5' UTRs and a comparison of mRNA 5' UTR secondary structures were performed. All parameters investigated suggest that ompN is the P. luminescens homolog of ompF. The P. luminescens ompN mRNA 5' UTR was deduced from alignment of sequences upstream of the ATG coding start site with 5'UTR sequences of Yersinia species (Figure 2). A comparison with Yersinia sequences is pertinent since Yersinia and Photorhabdus species are closely related evolutionarily [11, 12]. The P. luminescens ompN mRNA 5' UTR has a very high nucleotide sequence identity to the ompF mRNA 5'UTR of Yersinia pestis (89.5%). Interestingly, there is 100% sequence conservation at the 3' half of the 5'UTR from positions 61 – 111 (Figure 2). The Photorhabdus ompN 5' UTR also displays a high sequence identity with other gamma-proteobacteria ompF 5' UTRs (data not shown). Alignment of putative Photorhabdus luminescens ompN mRNA 5' UTR nucleotide sequence with ompF mRNA 5' UTRs of Yersinia pestis and Yersinia enterocolitica. The 5' end of the ompN 5' UTR was assigned by alignment with Yersinia and other enterobacterial ompF 5' UTR sequences. Y.e., Y.p., and P.l. refer to Y. enterocolitica, Y. pestis, and P. luminescens sequences, respectively. The Y. enterocolitica sequence can be accessed in the Y. enterocolitica Blast Server . Sequences were aligned with the DNASTAR, Inc program using ClustalW alignment. The putative P. luminescens ompN mRNA 5'UTR also shares signatures of the generalized ompF 5' UTR secondary structure. These signatures are highly specific to ompF mRNAs and consist of a long stem loop which starts at ~5–10 nt from the 5' end of the 5' UTR [23–25] (Figure 3). The stem contains several bulged and looped out positions. In addition, there is also a small stem loop close to the 3' end that encompasses the Shine- Dalgarno (S-D) ribosome binding site (e.g., GAGG in E. coli and Y . pestis). The Photorhabdus ompN mRNA 5' UTR closely conforms to the gamma-proteobacteria ompF mRNA 5' UTR secondary structure motif. Figure 3 shows a comparison with the Y. pestis ompF mRNA 5' UTR secondary structure. There are minor differences in the upper portion of the large stem loop, however base pairing differences are characteristic of ompF mRNA 5' UTR structures . Secondary structures of E. coli ompC, ompN and other outer membrane protein mRNA 5' UTRs do not display the ompF 5' UTR signatures. 5' UTR secondary structures of a) P. luminescens ompN mRNA 5' UTR and b) Y. pestis ompF mRNA. Structures modeled by the mfold program (26). Another important signature of ompF is the conservation and specificity of its upstream regulatory sequences. OmpR, a transcription factor found in E. coli and related organisms, is part of the two-component signal transduction regulatory locus ompB [27, 2, 28]. OmpR transcriptionally regulates expression of ompF and ompC genes in response to osmolarity change in E. coli and related species. Four OmpR binding sites F1–4 are located upstream of ompF in E. coli [29, 30] (Figure 4a). Figure 4b shows an alignment of OmpR binding sites F1, F2, and F3 upstream of ompF from several species, including the proposed site upstream of P. luminescens ompN. F 1–3 sites in P. luminescens were deduced by the alignment of sequences upstream of the ATG translational start site of ompN and of ompF from the four enteric bacteria shown. The E. coli sites as described by Bergstrom et al  were used as a base line. These sites are involved in transcriptional activation in E. coli. There is a comparable sequence identity between Photorhabdus and the three enterobacteria ompF upstream sites F1–3 (Table 2). In addition, most nucleotide positions crucial for OmpR binding in E. coli [31, 32] are conserved in P. luminescens sites, e.g., A4 C5 and A14C15 in F1, A34, C35 in F2, and C53 in F3. Conservation of these crucial positions suggests that the P. luminescens sites function in OmpR binding. A GNNNC motif found in OmpR binding elements  is present in the P. luminescens sequence, G11AAAC15, albeit there is only one copy which is in the F1 site (Figure 4b). a) Schematic of OmpR binding sites F1–4 located upstream of ompF in E. coli (29); b) Alignment of OmpR binding sites F1, F2, and F3 upstream of ompF in enterobacteria including the putative site upstream of Photorhabdus ompN. Ec, St, Ye, Yp, and Pl refer to E. coli S. typhimurium, Y. enterocolitica, Y. pestis, and P. luminescens sequence, respectively. The putative F 1–3 sites in P. luminescens were deduced by the alignment of sequences upstream of the ATG translational start site of ompN and of ompF from the four enteric bacteria shown. Binding sites are as follows: F1, positions 1–20; F2, positions 21–40; F3, positions 41–60. Note: two nt positions between F2 and F3, which are not part of F1–3 binding sites (29) are not included in the figure. The F4 site differs from F1–3 in that it is involved in repression and not activation of ompF expression . An hypothetical F4 site was also located upstream of ompN in Photorhabdus based on alignment of sequences with the nt positions and sequence described for the E. coli F4  (Figure 5). However, F4 sequences have diverged and are more complex than sites F1–3, e.g., Y. pestis and Y. enterocolitica species reveal low identity with the other gamma-proteobacteria (e.g., 28.6% and 33.3% identity respectively, compared with the E. coli F4 site) (Table 3). Although this is close to random identity, the Yersinia species have a GNNNC motif. The identity between Photorhabdus and the E. coli F4 sites is much higher, 52.4%, however the putative P. luminescens F4 lacks the GNNNC motif (Figure 5). Thus, it is unlikely that this sequence functions as a repressor of the proposed P. luminescens ompF. Nucleotide sequence upstream of ompN in P. luminescens aligned with F4 binding site sequences in four enterobacterial species. Sequences identified by alignment of upstream sequences as described in Figure 4 caption. Structurally, OmpF consists of trans-membrane beta strands and eight loops. Loop 3 (L-3) of OmpF is critical in formation of the channel pore and conductance and thus is a major functional determinant of the porin protein [33, 34]. The amino acid sequence of L-3 of the proposed P. luminescens OmpF-like porin was aligned with L-3 sequences from related bacteria (Figure S1, ,Supplement, Additional file 1). The Photorhabdus sequence displays a high identity to the L-3 loop sequences of X. nematophilia OpmP (88% identity) and the Yersinia OmpF L-3 (82%) (Table S1, Supplement, Additional file 1). The sequence identity to the E. coli OmpN L-3 is 68%. Interestingly, there are substantial differences between the other gamma- proteobacterial OmpF L-3, especially between E. coli and Salmonella (49% Identity) (Table S1, Supplement, Additional file 1). This suggests a complex selection pressure in amino acid sequence in related gamma enterobacteria and possible structure-function differences of this critical loop. An L-3 phylogenetic tree is in Figure S2, Supplement, Additional file 1). In summary, a) high identity with ompF mRNA 5' UTR sequences, b) shared mRNA 5' UTR secondary structure motifs, c) similarities between neighbor genes in the P. luminescens ompN locus and genes of the gamma-proteobacteria ompF locus, d) high sequence identities in upstream transcriptional regulatory sites F1–3, and e) identity of OmpF loop L-3 amino acid sequences all suggest that the annotated ompN gene is an ompF-ortholog in P. luminescens. plu1752 is situated between ompN and asnS in the annotated P. luminescens genome (Figure 1). The coding nucleotide sequence of plu1752 shows no frameshift mutations, no insertions, and one triplet deletion when sequences are compared with the proposed P. luminescens ompF (data not shown). Thus plu1752 encodes a nearly full length protein compared with OmpF. plu1752 has a 59% amino acid sequence identity to the P. luminescens OmpF-like porin and 59% identity to the X. nematophilia OpmP. Its identity with E. coli and Yersinia pestis OmpC proteins is 55% and 51% respectively, and 51% to OmpS1, a porin protein gene (distinct from ompF and ompC) in Salmonella typhi str. CT18. The amino acid sequence identity of plu1752 is closest to OmpF-related proteins but only slightly higher than to OmpC proteins. On the other hand, the plu1752 deduced mRNA 5'UTR sequence displays a high identity with that of the proposed ompF 5' UTR ompF 5' UTR (76.4%). Interestingly, the plu1752 5'UTR sequence also has a 28 bp insertion in the 3' region. However, the proposed plu1752 mRNA 5'UTR secondary structure closely resembles that of the P. luminescens ompF 5' UTR (Figure 6) and the 28 base insertion between positions 92–93 of the ompF 5' UTR does not appear to perturb the large stem loop, the primary ompF 5' UTR structural motif. The plu1752 5'UTR maintains the four looped out/bulged positions present in ompF 5' UTR major stem loop, albeit there are nucleotide sequence changes in these regions. Importantly, there are several base pair compensatory changes in stem sequences, e.g., in the stem closest to the top loop there is a change of the pairing U38-A47 (ompF, Figure 6b) to G40-U48 (plu1752, Figure 6a). This is strong evidence for evolutionary relatedness. The plu1752 mRNA 5'UTR displays poor sequence identity to the enteric ompC mRNA 5' UTRs (e.g., 47% and 36% to Y. pestis and E. coli, respectively) thus making it unlikely that it is an otholog of ompC. However, there is an apparent absence of an ompC gene in P. luminescens (see below). a) Deduced plu1752 mRNA 5'UTR secondary structure by mfold. Structure shown is alternate structure 4 from mfold (mfold structure 1 displays minor base pairing within the 28 bp insert but no differences in stem-loop structure), b) P. luminescens ompF mRNA 5' UTR secondary structure model. Comparison of the plu1752 upstream region with regions upstream of enterobacterial ompF genes reveals a close similarity with OmpR binding sites F1–3 (Figure 7a). Deduced F1–3 sequences of plu1752 show 70% identity with F1–3 sites of the proposed P. luminescens ompF. In addition, several base positions highly critical for OmpR binding (as described for Figure 4b) are also conserved in the plu1752 sites (Figure 7a) but also noted is the presence of only one GNNNC motif (G50TATC55, in F3). The upstream regulatory region of plu1752 is, however truncated, i.e., there are only 142 bp between plu1752 and its upstream gene, asnS gene. Thus, plu1752 appears to have no potential for an F4 binding site. The plu1752 -10 and -35 promoter sequences are nearly identical to those of proposed P. luminescens ompF (Figure 7b). a) Alignment of upstream sequences of plu1752 with the F1–3 regions of enterobacterial ompF. Boundaries of F1, 2, 3 as in Figure 4b caption; b) comparison of -10 and -35 promoter sequences of plu1752 and P. luminescens ompF. Loop 3 of Plu1752 protein has a high amino sequence identity with the proposed P. luminescens OmpF-like porin (77%) (Table S1, Supplement, Additional file 1). The identity with representative gamma proteobacterial OmpF L-3 sequences is much less and ranges from 44%- 59%, with the exception of sequences of Xenorhabdus (68%) and Yersinia (71%) (Table S1, Supplement, Additional file 1). Judging by the strong similarities in signatures between plu1752 and the proposed P. luminescens ompF, plu1752 may have arisen by a duplication of the ompF-like porin. A phylogenetic tree of the P. luminescens proposed ompF and ompF duplication 5' UTR sequences with representative omp 5' UTRs of other bacteria is shown in Figure 8. The P. luminescens ompF and ompF duplication sequences form a cluster with E. coli/Yersinia sp. ompF 5' UTR sequences and removed from ompN and ompC 5' UTRs. Phylogenetic tree of outer membrane protein mRNA 5' UTRs. Alignment and phylogenetic tree of outer membrane protein 5' UTRs was performed with the DNAStar ClustalW sequence alignment program. A comparison of plu1752 characteristics with ompF is in Table 4. In view of the large number of non- synonymous mutations (changes in amino acids), i.e., 59% identity in amino acid composition between P. luminescens ompF and plu1752, the proposed duplication may have been an ancient one. S. typhimurium and E. coli separated about 140 million years ago and the percent amino acid changes between the plu1752 protein and the proposed P. luminescens OmpF are about the same as those between S. typhimurium and E. coli OmpF proteins (Table 4). However, further phylogenetic analyses are needed to better understand the proposed duplication event. ompC, which codes for the smaller porin protein was not detected in P. luminescens. For example, ompC nearest neighbor genes such as ubiG, gyrA, rcsC, and rcsB are grouped together in E. coli and Yersinia pestis and are also conserved as a group in P. luminescens, but the Photorhabdus locus does not show an annotated ompC . Blast searches of the P. luminescens genome using the ompC coding sequence, the ompC mRNA 5' UTR sequence, and the ompC amino acid sequence from E. coli and Y. pestis did not yield sequences orthologous to ompC (data not shown). In addition, various other E. coli porin protein sequences were employed to search the P. luminescens genome using the NCBI protein tblastn program, however no other porin protein sequences were detected with the exception of the proposed ompF and ompF duplication plu1752. In E. coli and related species, the micF gene is an independent transcriptional unit with its own promoter and it does not overlap other genes . However, micF and ompC are in the same chromosomal locus and are linked by a regulatory region (253 bp in E. coli) that includes binding sites for the transcription factor OmpR . These serve as sites for both micF and ompC transcriptional activation by OmpR . This linkage region is conserved in all enterobacteria known to contain a micF gene . The region is complex and has binding sites for eight transcription regulators of E. coli micF [3, 18, 37]; also, see [38, 39]. In P. luminescens, both the micF and ompC genes are missing from the chromosomal locus where they normally are found. micF may have been transposed to another region of the chromosome, however blast searches with micF gene sequences from E. coli and Yersinia species, as well as with the conserved 253 nt regulatory region did not reveal homologous sequences in the P. luminescens genome. Strategies employed to further search the P. luminescens genome for micF were based on conserved portions of the micF sequence and phylogenetically conserved micF RNA/ompF mRNA 5'UTR duplex structural motifs. In all organisms where micF RNA is found (more than 6 species), there is a total conservation of the13 nt sequence at the 5' end . This sequence is 5'GCUAUCAUCAUUA3' and it forms a major part of the base pairing between micF RNA and ompF mRNA 5' UTR. A hypothetical P. luminescens micF RNA would consist of the same sequence based on the highly conserved portion of ompF mRNA 5'UTR (see Figure 2), with the exception of C2 to U2 change (Figure 9). (left) Hypothetical P. luminescens ompF mRNA 5' UTR/micF RNA duplex and (right) Y. pestis ompF mRNA 5' UTR/micF RNA duplex at the 3' ompF UTR – 5' micF end interface. The C or U changes in the P. luminescens hypothetical micF RNA (left) were part of the sequences variations used in searches. Intergenic regions (i.e., non protein coding regions) of the P. luminescens genome were scanned for sequences that provides a structure similar to the RNA/RNA duplex structure found in enterobacterial species. Permutations in the hypothetical P. luminescens 5' end micF sequence shown in Figure 9 involved the use of four random substitutions in this sequence (in addition to the two C to U variables shown in Figure 9 left). Also, added structural constraints for the total hypothetical micF RNA structure used consisted of a rho-independent termination motif at 35–85 nt downstream from the 3' end of the 13 nt sequence. The P. luminescens genome was scanned and sequences analyzed. A match with forty- three positives was found for a putative micF RNA with the above mentioned constraints. These positives were further analyzed for ability to form an RNA/RNA duplex structure that is consistent with the conserved generalized micF RNA/ompF mRNA 5' UTR duplex structures of various enterobacterial sequences . Five positives were found, however four of these have sequences in the 3' region of the hypothetical RNA chain that partly overlap protein coding genes and thus were discounted. The fifth sequence did not overlap a coding region and provided a similar interaction displayed by the Yersinia RNA/RNA duplex (Figure S3a, S3b, Supplement, Additional file 1). However a) this structure did not display the ompF 3' end/micF 5' end RNA/RNA duplex motif consisting of "blunt ends" (Figure 9, right) , and b) the percent identity of this fifth sequence with the Y. pestis micF sequence is low, 35.2%. Therefore this "fifth positive sequence" was also discounted as a micF candidate, albeit we cannot exclude that this may constitute an RNA transcript from promoter search analyses (Supplement, Additional file 1). No other intergenic sequences provided all the prerequisite RNA/RNA duplex signatures. A third type of search was performed with a hypothetical P. luminescens micF sequence that would form a perfect 14 bp complement to the ompF 5'UTR 3' region (see Methods and Materials) and no positives were found in a search of the P. luminescens genome. Thus, a) no micF-conserved 5' end 13 nt sequence (nt sequence in Figure 9, right), which has a rho -independent termination motif at less than 85 nt downstream of the 13 nt sequence, matched in the intergenic regions of P. luminescens, b) no P. luminescens intergenic sequences provide all the prerequisite signatures of the micF RNA/ompF mRNA 5' UTR duplex. In addition, the P. luminescens chromosomal locus where one would expect to find micF is partly rearranged and does not contain micF (or ompC). If a putative P. luminescens micF RNA/ompF mRNA 5' UTR duplex structure diverged significantly from the phylogenetically conserved structures used for comparison, a Photorhabdus micF sequence would have been missed. Since the P. luminescens ompF mRNA 5'UTR has a secondary structure that closely conforms to the generalized 5' UTR structure and the 3' end of this UTR sequence that would interact with a hypothetical micF RNA is, with the exception of one nt change, completely conserved, it is less likely that a Photorhabdus RNA/RNA duplex structure would exist that diverges significantly from the consensus. The E. coli and Y. pestis intergenic regions of the chromosome were also scanned using the above parameters and the respective micF sequences were detected in these controls. The regulatory micC RNA was isolated and characterized in E. coli and homologous micC sequences were detected in close relatives such as Klebsiella pneumonie, but not in Yersinia species . This RNA is 109 nt in chain length and regulates ompC expression post-transcriptionally in response to stress conditions . Since the target ompC gene does not appear to be present in P. luminescens, it appears unlikely fhat P. luminescens would have micC. However we considered the question of whether "fossil" micC sequences may still be present. The P. luminescens genome, including the genomes of Y. pestis and Y. psedutuberculosis (which were not previously shown to have micC), were scanned for sequences that match E. coli micC. Blast searches with the NCBI Discontinuous Blast Program and utilizing the E. coli micC sequence as the query did not yield a match. micC nearest neighbor genes were analyzed as well. In E. coli K12, ydpK (pyruvate-flavodoxin oxidoreductase gene) is situated 30 bp downstream from micC and ompN is 227 bp upstream of micC . ydpK has not been annotated in P. luminescens and a blast search of the P. luminescens genome using the Y.pestis pyruvate-flavodoxin oxidoreductase amino acid sequence yielded only minor similarities to unrelated proteins. Thus we could not locate a locus encompassing the micC nearest neighbor genes in the P. luminescens genome. Since Yersinia species have an ompC, theirgenomes were further searched for a micC homolog by analyzing sequences in a putative micC locus. ydpK is present in Y. pestis and Y. psedutuberculosis but annotated as nifJ. A hypothetical protein (with conserved domains similar to adenine nucleotide alpha hydrolases) is the nearest downstream neighbor (the location of micC and ompN in E. coli K12). An analysis of the sequence immediately downstream of nifJ was made to search for a potential sequence that may represent a micC homolog in Y. pestis and Y. psedutuberculosis. The 275 bp sequence (positions 2662970-2663245) downstream of the end of 3' end of nifJ and upstream of the start of YPT 2254 (hypothetical protein) contains a probable rho- independent termination motif, however it did not yield significant sequence identity when aligned with the E. coli micC sequence (unpublished). Udekwu et  characterized a small regulatory RNA termed micA that post- transcriptionally controls E. coli OmpA synthesis. The micA sequence was also identified in other enterobacteria, including Yesinia pestis  but not in more distantly related organisms. OmpA, the target of micA, has been annotated in the P. luminescens genome at positions 2117794-2118900 . The putative P. luminescens ompA mRNA 5' UTR sequence was deduced from an alignment of sequences upstream of the P. luminescens ompA ATG start with E.coli and Y. pestis ompA mRNA 5' UTR sequences (Figure S4, Supplement, Additional file 1). 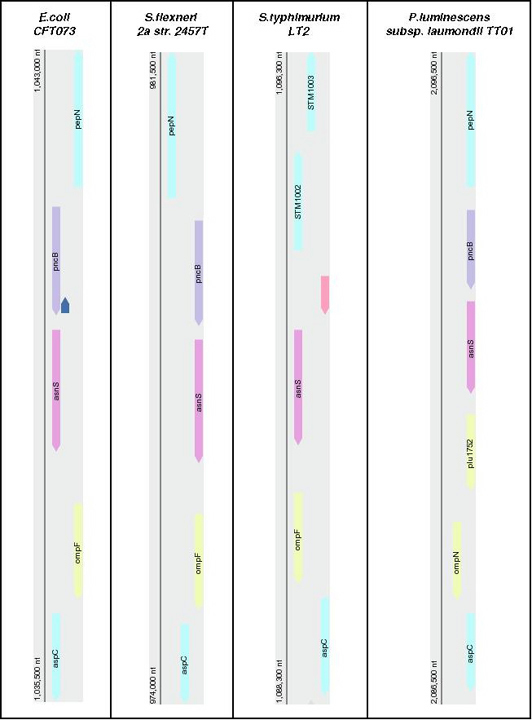 The 5' UTRs of the 3 species show a divergence in sequence, particularly that of P. luminescens, but the region encompassing ~30 nt at the 3' end of the mRNA 5' UTR, the site that interacts with micA RNA in E. coli , is highly conserved and shows an identity of ~80% between P. luminescens and E.coli and Y. pestis ompA mRNA 5' UTR sequences. The P. luminescens genome was searched for sequences similar to micA. A blast search using the E. coli and Y. pestis micA nucleotide sequences did not yield a match. In E. coli and Y. pestis genomes, micA is found between luxS and gshA . To further search for the RNA gene, the nucleotide sequence between luxS and gshA in P. luminescens was scanned for homology to micA sequences. This region in P. luminescens was aligned with E. coli and Y. pestis micA sequences and a putative micA homologous sequence was identified (Figure 10). Position 52 shown in Figure 10 is the 5' start of the micA gene and positions 1–51 encompass the upstream promoter region. micA sequence identities between the four organisms shown are in the range of 58.8 – 61.8%. The 23 bp segment at the 5' end region of the putative P. luminescens micA, that includes sequences that would interact with the P. luminescens ompA 5' UTR, shows a slightly higher identity of 65.2% compared with both E. coli and Y. pestis micA 5' end regions. In addition, the upstream -10 and -35 promoter sequences are nearly identical between P. luminescens and Y. pestis (Figure 10). Alignment of micA sequences with upstream promoter region sequences. Position 52 is the 5' start of the micA gene and the upstream sequence shown encompasses positions 1–51. In P. luminescens, the putative -10 promoter site is at positions 40–45 (GTCATA sequence) and the -35 is at 16–21 (ATGAAA sequence). The P. luminescens micA and upstream region sequences shown in the figure are located at genomic positions 1451620-1451502. 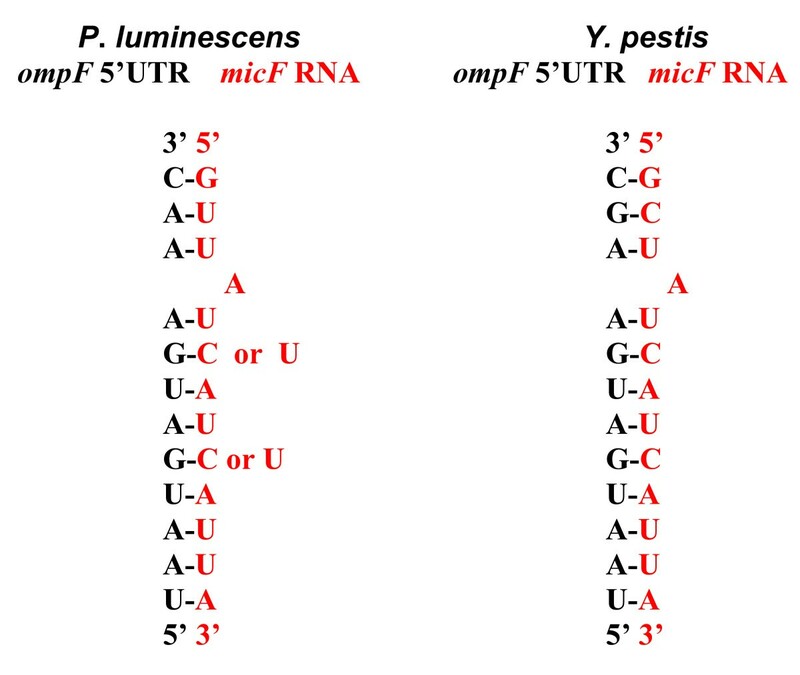 The P. luminescens sequence displays the major signatures of micA RNA, i.e., a rho-independent termination motif at the 3' end and the potential of 5' end sequences to base pair with region of the mRNA 5'UTR that covers the S-D sequence. Secondary structure models of the putative P. luminescens micA RNA together with E. coli and Y. pestis micA RNA structural models are in Figure S5, Supplement, Additional file 1. Figure 11 shows proposed micA RNA/ompA mRNA 5' UTR duplex interaction for P. luminescens, together with duplexes from related enterobacteria. All duplex models were obtained by the mfold program . Although there are variations in duplex structures, the P. luminescens duplex shows close similarities to the other structures, e.g., shielding of the mRNA S-D ribosome binding site by the 5' end region of micA RNA, similarity in the length of the RNA/RNA duplex interaction and a similarity in 5' nucleotide position of micA RNA that participates in base pairing. Thus we propose that the sequence at positions 1451569 – 1451500 of the P. luminescens genome represents the micA gene homolog in P. luminescens. Secondary structure models of micA RNA/ompA mRNA 5' UTR interaction. a) E. coli, b) Y. enterocolitica, c) Y. pestis, d) P. luminescens. Note: the ompA mRNA 5' UTR and micA sequences of Y. enterocolitica were not previously published. In this study, ompA and micA gene sequences were identified in Y. enterocolitica by a blast search of the genome using the Sanger Institute blast server . By bioinformatics methods, Griffiths-Jones et al  and Hershberg et al  predicted and cataloged the small non-coding RNAs/RNA genes present in E. coli and related organisms. Seventeen are regulatory RNAs in E. coli (Table S2, Supplement, Additional file 1). Of the total small RNAs reported for P. luminescens on the Rfam website  (also D. Schones, Cold Spring Harbor Laboratory and N. Delihas, unpublished data), five genes encode regulatory RNAs (Tables S2 and S3, Supplement, Additional file 1). The work reported here adds micA to this list. Twenty-five E. coli ncRNAs are of undetermined function (Table S4, Supplement, Additional file 1) and P. luminescens shares four of these ncRNA genes. P. luminescens evolved to proliferate in specialized environments and this poses interesting questions in terms of its gene composition. For free living bacteria, cell surface components and associated regulatory mechanisms are crucial to survival. The work here focuses on outer membrane porin protein genes and their regulatory RNA genes. An ompF-type gene has been identified in P. luminescens as well as a putative ompF duplication (ompF paralog). The proposal for an ompF paralog is strongly supported by the mRNA 5' UTR compensatory base-pair changes, which maintain secondary structure signatures (Figure 6). The ompF-like gene was originally annotated as ompN in the P. luminescens genome, but there is no evidence for an ompN in Photorhabdus, either in chromosomal location or in the putative mRNA 5' UTR sequence. The homolog to ompC, which encodes the smaller porin has not been detected. No other porin protein genes, such as phoE  were found, but the specialized porin gene lamB, which encodes the protein involved in transport of maltose and maltodextrins across the cell envelope  has been annotated in P. luminescens . In addition, ompA, which encodes a cell envelope protein that has multiple functions, was also previously annotated in P. luminescens. OmpF is a generalized porin. It functions to allow for the intake of small nutrients into the cell and therefore serves an indispensable function. Therefore one would expect to find an ompF-type gene in P. luminescens. ompF is found in gamma subdivision enterobacteria whose genomes have been sequenced, including the obligate symbionts such as Buchnera and Wiggleswothia [46, 47]. In E. coli, OmpF is one of the most abundant proteins in the cell. But perhaps each organism evolved its own porin properties such as conductance and pore size based on needs to thrive in specialized habitats and there may be nuances between E. coli and related bacterial OmpF functions. OmpC is also a generalized porin, but may function primarily under conditions of high osmolarity . OmpC may not be essential during either the symbiotic or pathogenic phases of P. luminescens. OmpA is a surface protein essential for the structural integrity of the cell envelope and as expected, is widely found in Gram-negative bacteria. The function of OmpN in E.coli is not known and it is uncertain whether ompN is an essential gene in other species. OmpN is expressed at very low levels in E. coli strain BL21 when grown in rich media , however levels in cells grown in minimal media were not determined. Interestingly, strain E. coli O157:H7 EDL933 appears to have a truncated ompN gene that codes for only123 amino acids out of the 377 amino acid sequence found in E. coli K12. Salmonella enterica (subsp. enterica serovar Typhi str. CT18) lacks an ompN gene at the E. coli ompN chromosomal site but has instead a transposase insertion sequence (unpublished). It appears that ompN is a pseudogene in E. coli O157:H7 EDL933 and it may not be uniformly present in species closely related to E. coli. The proposed ompF duplication in P. luminescens (plu1752) does not appear to be a pseudogene. It codes for a nearly full length OmpF-type polypeptide, maintains a porin structural motif  and has upstream nucleotide sequences similar to three of the four OmpR binding sites and sequences almost identical to the -10 and -35 promoter region of P. luminescens ompF. Assuming plu1752 arose from ompF, it appears that the coding sequence has diverged from ompF, i.e., there is 59% amino acid sequence identity between ompF duplication and ompF coding regions. Why is there a duplication of the ompF-type porin gene in P. luminescens? This may be related to requirements for small solute assimilation and a paralog of this porin may offer an advantage for survival of this organism in its specialized ecological niches. There are some differences between the P. luminescens putative ompF and plu1752 Loop 3 amino acid sequences but no apparent changes in net charge. Amino acid sequence differences in L-3 can affect pore properties [33, 34]. The plu1752 putative mRNA 5' UTR and upstream OmpR binding region also have some changes. Therefore, it is possible plu1752 is regulated differently from the putative ompF and/or serves a more specialized function. There is an apparent absence of a micF RNA gene homolog in P. luminescens. This suggests that post-transcriptional regulation of ompF expression is not essential for survival of this organism. In E. coli, micF expression is increased when the cell is under environmental stress conditions, e.g., exposure to toxic compounds, high temperature, cationic peptide antibiotics, or oxidative stress . The confined life cycle of P. luminescens, involving only endosymbiotic and pathogenic phases, perhaps precludes exposure to these stress conditions. Thus Photorhabdus may have lost the micF gene when it evolved into an endosymbiont. OmpA mRNA is degraded faster when E. coli cells enter stationary phase compared with log phase  and micA RNA appears to down-regulate ompA expression when cells enter stationary phase . P. luminescens appears to have retained the micA gene. During the pathogenic phase, P. luminescens will go into stationary phase when insect nutrients are depleted . Thus the proposed micA RNA may serve a similar function in P. luminescens as it does in E. coli. However, regulatory RNAs may not serve identical functional roles in organisms with different habitats. For example, Serratia marcescens micF responds to most but not all environmental factors that affect micF in E. coli . Photorhabdus appears to have fewer E. coli regulatory ncRNA genes than its close relatives (Table S2, Supplement, Additional file 1). Important is the absence of rygA and rygB, two ncRNA genes that are proposed to regulate multiple outer membrane proteins in response to environmental conditions . However, further searches are needed to definitively show absence of these genes in P. luminescens. On the other hand, P. luminescens, because of its complex life cycle, may have its own group of regulatory ncRNAs. For example, a small RNA has been hypothesized to regulate pathways leading to either symbiosis or pathogenicity . In the extreme case of the obligate endosymbionts such as Buchnera and Wiggleswothia, only the E. coli housekeeping RNA genes are reported and there were no regulatory RNA genes found  (and D. Schones and N. Delihas, unpublished). Control of gene expression by RNA may be more prevalent in cells where survival is dependent on the ability to make rapid adjustments in response to environmental stress. Bacterial regulatory ncRNA genes probably evolved to help the organism survive under different environmental conditions and stress-related factors and these genes may not be present in organisms that live in more protected environments. Parallel to this, loss of transcriptional regulators has been reported for the obligate symbiont Buchnera, which grows only in the aphid host . Analysis of the P. luminescens genome described here and by others shows essential outer membrane protein genes ompF, ompA and a proposed duplication of ompF. The post-transcriptional regulatory RNA gene micA appears to also be present, but the ompF regulatory counterpart micF is not evident. The presence or absence of certain ncRNA genes in Photorhabdus appears consistent with the rationale for a need or lack of need. On the other hand, new RNA genes may have evolved to help the organism thrive in its environment. Further analyses of the P. luminescens genome by bioinformatics and/or microarray analyses may reveal regulatory ncRNA genes or gene transcripts that may be unique to Photorhabdus and closely related species that function in the pathogenic phase. Along with the marked increase in virulence genes [13–15], genes that encode both regulatory proteins and regulatory RNAs may also have evolved and/or were acquired to increase the pathogenicity of the organism. Two pertinent projects are underway. The genomes of the related symbiont and/or insect pathogens, Xenorhabdus nematophilia  and Photorhabdus asymbiotica  are currently being sequenced. When completed, these sequences may add to and/or complement the assessment of outer membrane porin genes and RNA regulatory genes presented here. P. asymbiotica is of particular interest since in some instances it is found to cause human opportunistic infections. This organism offers exciting opportunities to further assess virulence factors and their regulation. To search for outer membrane protein and regulatory RNA genes, the BLAST GenBank site of the National Center for Biotechnology Information  was used. Genome searches were with the BLAST with microbial genomes page ), with the exception of the Yersinia enterocolitica genome where the Welcome Trust Sanger institute site  was employed. The Entrez cross-database search page  was used to find nearest neighbor genes. RNA secondary structure modeling was performed with the Zuker and Turner Mfold, version 3.2 [59, 26]. Standard constraint parameters were used with the following: maximum interior/bulge loop size was 30, maximum asymmetry of an interior/bulge loop was 30 and there was no limit on maximum distance between paired bases. 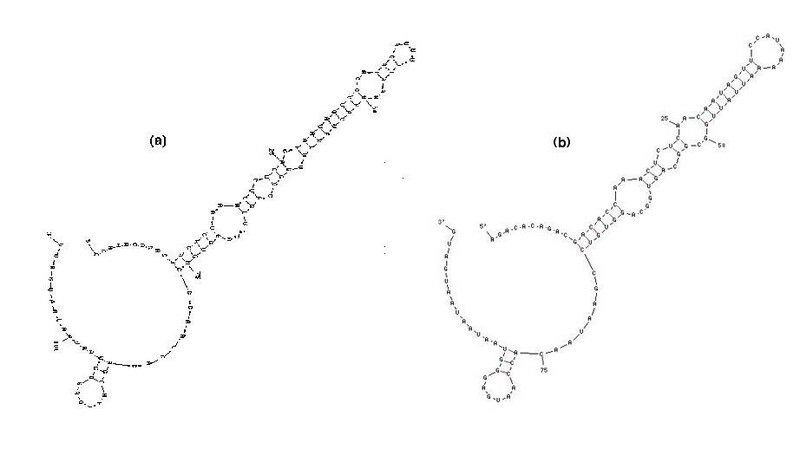 mRNA/ncRNA duplex structures were obtained by positioning the two individual RNAs 5' to 3' one after the other starting with the mRNA first and adding ten Ns between the two polynucletides. RNA secondary structures were displayed with the New Structure Viewing Options and figures in this paper were modified from graphic dispay by Output of sir_graph by D. Stewart and M. Zuker. Nucleotide sequences were aligned with the DNASTAR MegAlign alignment program . Parameters used were that of J. Hein with gap penalty 11, gap length, 3; ClustalV, with gap penalty 10, gap length 10 or ClustalW with gap penalty 15, gap length, 6.66. Percent identities and consensus sequences were based on DNASTAR program. Proposed 5' start of RNAs was based on alignment with known 5' start sites of homologous RNAs. The strategy used to search for a putative micF RNA in P. luminescens was to scan the genome using the conserved 13 nt 5' end micF sequence, i.e., 5'G1CTATCATCATTA133' as well as variations of this sequence. Variations included T at position 2, T at positions 6 and 9, and in addition, a total of 4 random substitutions. A different first pattern that provides perfect complementarily to the ompF mRNA 5' UTR was also employed: 5'G1TTTCATCATTATT143'. Variations included a total of four random substitutions and also allowing for the insertion of an A residue randomly between the 3rd and 10th base of the pattern. Additional constraints consisted of a rho- independent termination pattern situated 35–85 bp downstream the two basic 5' end patterns shown above. The parameters used for the terminal rho- independent structure were a stem-loop followed by at least four T residues. The stem was 4–15 bp with a minimum of three G-C pairs, the loop 3–8 bases, and the maximum folding energy of loop was -9 Kcal/mol. Scans for the termination motif were performed after the initial identification of the two patterns shown above. where P is the assigned probability, w is a DNA character assignment, C(w) is the frequency of the character in the consensus table for the specific position, N is the number of training sequences used for the creation of the consensus table and B is the number of possible values for our character i.e., 4.
nt, nucleotide; N, any of the four ribo- or deoxyribo-nucleotides A,C,G,U, or T; Mb, 106 base pairs (megabases); S-D, Shine-Dalgarno ribosome binding site; ncRNA, non-coding RNA. OmpA, outer membrane protein A; OmpC, outer membrane protein C; ompN, outer membrane protein N; OmpF, outer membrane protein F.
Second review following revisions: The manuscript by Papamichail & Delihas deals with the prediction of outer membrane proteins (OMP) and their regulators in the genome of Photorhabdus luminescens. The genome of Escherichia coli, a close relative of P. luminescens, contains three major outer membrane proteins that are regulated by trans-coded antisense RNAs. Using bioinformatics tools, Papamichail & Delihas search for the existence of similar genes in the genome of P. luminescens. Following the first review iteration, bioinformatics analyses have been added to improve the manuscript. In its current state, the study presents a convincing evidence for the existence/loss of OMP in P. luminescens. - In figure 1, there are two unmarked objects: a blue one in E. coli, and pink one in S. typhimurium. Following the reply to the first review I now know which are they, but I think it is important to repot the information also to the reader (i.e., in the figure's legend). - The presented alignments would be clearer in PrettyAlign format, or any other tool/format that presents an alignment with color-coded animo-acids. Such format enables the reader an immediate overall perception of the sequences' conservation degree. - Citing links that oblige the user to enter some detail (such as CDD and other NCBI links) may be problematic, mainly because the cited databases may be updated after the publication of the manuscript. I would recommend saving the query result and adding it as supplementary material. Second review following revisions: We have no further comments. The paper is much improved following revision. Drs. Gelfand's and Gerasimova's initial comments were that the manuscript was interesting but limited in that a global assessment of ncRNAs as well as phylogenetic relations of ompFs were needed. These have been included in the Supplement. Second review following revisions: The authors describe a search of the Photorhabdus luminescens genome for outer membrane proteins and for their trans encoded small RNA regulators. In addition to the previously recognized ompA homolog, the authors identify two ompF homologs in the P. luminescens genome that evolved from a gene duplication. A search for small regulatory RNAs only identifies a micA homolog. The authors discuss their findings in light of the P. luminescens lifecycle. Minor criticisms and suggestions were made [in the first review] and the have authors satisfactorily addressed these. D.P. was partially supported by NSF grants EIA-0325123 and DBI-0444815, with additional funding from Brookhaven National Laboratory. We thank Dr. Steven Skiena for initial discussions concerning design of bioinformatics approach and thank Drs. Daniel Dykhuizen, Michael Hadjiargyrou, and Steven Skiena for reading the manuscript and providing comments. D.P. designed bioinformatics search programs and obtained data for micF. ND designed overall experimental approaches and obtained data for outer membrane proteins and regulatory RNAs.